Tom Loeser, “Dig for Three,” 2015. Walnut, shovel handles. 46 x 34 x 34 inches. Photo courtesy of the artist. Simple ideas, reimagined. This is central to Tom Loeser’s practice. A stunning combination of craft, whimsy, and invention, his pieces of furniture take on an unconventionality both functional and dysfunctional. 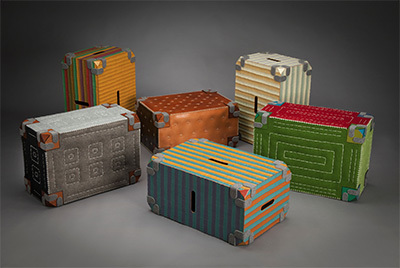 On view in the main gallery of the Houston Center for Contemporary Craft through May 12, 2019, Tom Loeser: Please Please Please is a playful exhibition that encourages viewers to reconsider the way they interact with their environments. Tom Loeser, “Folding Chair,” 1987. Painted plywood, maple, stainless steel. 34 x 25 x 22 inches (when open). Photo courtesy of the artist. “The core of my work is thinking about function and undermining the way things work,” Loeser said. Throughout his career, the artist has striven to help furniture fulfill its potential as an artistic medium. 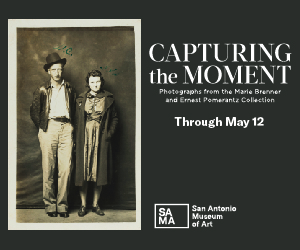 It is an affinity that has lasted for years and propelled the expansion of his practice through the exploration of different media and environments. This fondness for furniture began early for Loeser as he joined the staff of a teaching woodworking shop after graduating high school. While he initially pursued art when he left for college, he didn’t connect well with the professors or the program, instead deciding to major in Sociology and Archaeology. “There’s fun and pleasure in how we organize and socialize ourselves,” Loeser stated as he detailed the intricacies of his designs. It was upon his return to Cambridge, though, that he found a clearer trajectory for his practice at the Boston University Program of Artisanry, an apprenticeship program. 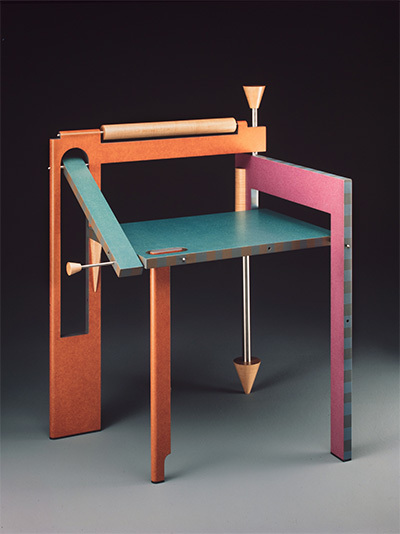 Loeser spent three years honing his skills with form and function while redefining his creations through their design. “I loved the situation in the shop and would stay there until 2 or 3 in the morning,” he recalled. “The faculty would push us to explore the conceptual aspects of our work.” This is where his exploration of unconventional forms began. Loeser produced a colorful series of postmodern chairs that would fold flat and double as hangable art. The chairs appear complicated, accented like abstract paintings, but function quite simply, folding and unfolding like wooden origami figures. Tom Loeser, “Scythe by Scythe,” 2016. Maple, hickory, scythe handles. 102 x 32 x 49 inches. Photo courtesy of the artist. For 30 years, Loeser has continued his investigation into this balance, constructing benches, stoops, tumblers, and other furniture while reconsidering their origins and purposes. The series “handle tool,” for example, addresses the union of tool and material utilized across any form of craftsmanship and reconsiders the role of both. 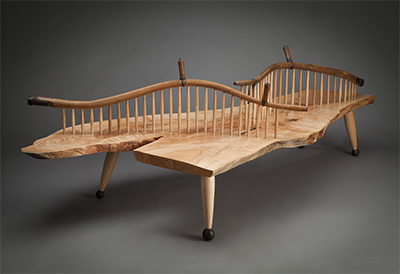 Inspired by the work of George Nakashima, a master furniture maker and leading innovator of 20th century furniture, Loeser’s benches are as imaginative as they are sleek. 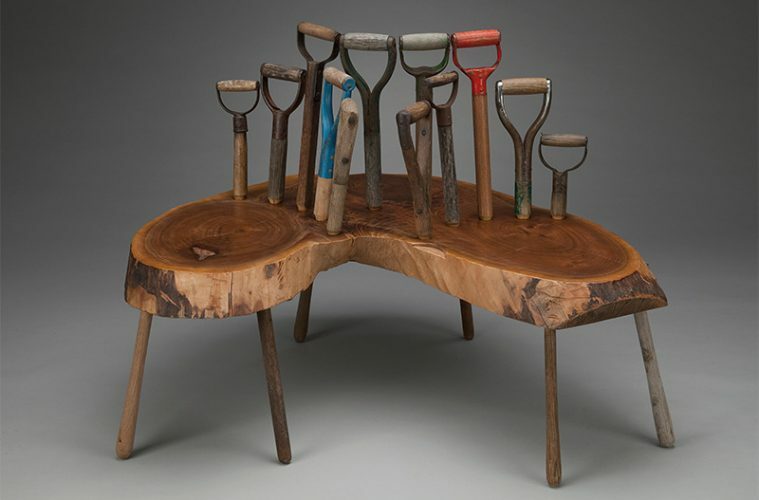 For Dig 23, Loeser severed the handles of shovels he collected, affixing them to a slab of urban cut wood sat atop other sections of those shovels repurposed as legs. An artful if rustic rendition of a fully functional bench, it invites viewers to have a seat. Similarly, Scythe by Scythe, perhaps a playful reimagining of “side by side,” consists of two scythe snaths with stems intact winding across a plank of wood, splitting the bench into uneven spaces that force sitters to situate themselves comfortably. Tom Loeser, “LA/Chicago/New York,” 2016. Wood, paint, felt. Approximately 12 x 17 x 26 inches each. Photo courtesy of the artist. The artist’s playful experimentation with the form of furniture is also easily noted in his two-dimensional works on paper. Creating both cyanotypes and pyrographs, he uses metal brands shaped like chairs to burn their likeness onto paper through exposure or direct impressions. 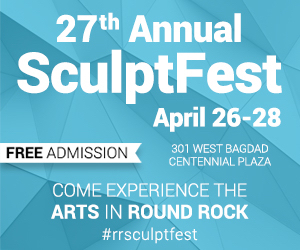 “The directness and immediacy of the branding and the playfulness of the exposures have been a refreshing change of space from the hours in the shop,” Loeser said. Across his work, Loeser presents a versatility in furniture that people often don’t consider. We don’t always consider the impact that furniture has on our lives and our social interactions. Through Please Please Please, Loeser invites this into our mind the next time we have a seat.